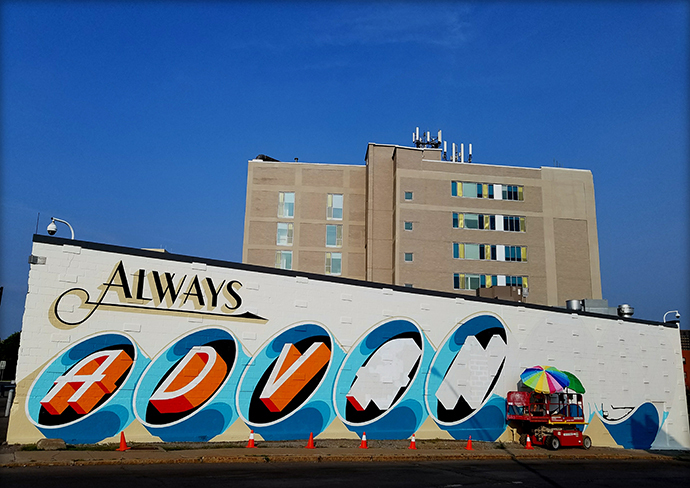 A 105-foot by 20-foot painted mural—”Always Advance”—has emerged on a west-facing, street-level wall of the Nancy Cantor Warehouse, at a major, high-traffic interesection in downtown Syracuse. It’s one of 11 new pieces of permanent art that began to be installed last summer along the Connective Corridor. Some are three-dimensional pieces, while others—like “Always Advance”—are hand-painted typographic murals. “Always Advance” is by Best Dressed Signs of Jamaica Plains, Massachusetts, with the work being done by artists Josh Luke and Meredith Kasabian. According to Luke, the pair began a few weeks ago by prepping the wall, then sketching the design on the wall before starting the detailed painting. They just recently completed it. In creating the design, Luke and Kasabian considered the principles of SU’s School of Design in the College of Visual and Performing Arts, as well as the historical context of the area and the City of Syracuse; among the key concepts were design, innovation, creating change and driving progress. Say the artists: “The rich history of entrepreneurship and industry that made Syracuse one of America’s most prosperous industrial cities of the 19th and early 20th centuries was founded upon the idea of advancement or progress. One of the city’s particular claims to fame is the production of the Smith Premier typewriter. Among its myriad and far-reaching advantages, the invention and mass production of typewriters helped to advance the careers of women typists in the early 20th century, eventually leading to the acceptance and advancement of women in many male-dominated fields, including design. Other new artwork along the Connective Corridor includes two other hand-painted sign projects: a two-part mural, “You’ve Made It … … Till Next Time,” completed by Jon Bocksel of Hand Signs/Brooklyn in June 2016 on two walls of 321 W. Fayette St. and “We are the Mighty Salt City Syracuse New York,” completed by Cayetano Valenzuela of Black Rabbit Studio/Syracuse in November 2016 on a wall of the Access CNY building at 420 E. Genesee St.
All of the commissioned pieces along the Connective Corridor are the result of two public art calls in 2015 to seek artists who could create new original installations for Syracuse: a $650,000 contest that drew 276 applications from local to international artists from 17 countries and a $150,000 direct call to prominent and up-and-coming sign painters. Management of the project has been led by SU’s Office of Community Engagement, working with a steering committee that includes representatives from the College of Visual and Performing Arts, the Syracuse-Onondaga County Planning Agency, the Downtown Committee of Syracuse, CNY Arts and the Syracuse Public Art Commission. Funding is via grants provided by Empire State Development and the Dormitory Authority of the State of New York.